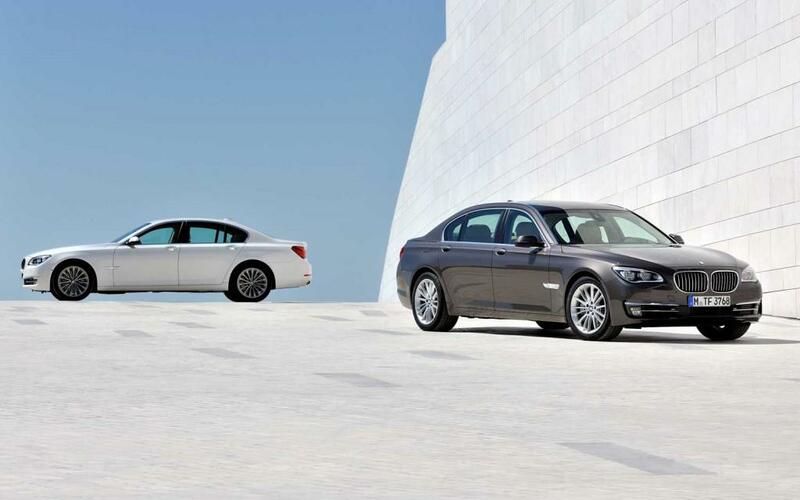 As BMW’s flagship, the 7 Series sedan needs to be at the forefront of technology in order to stay competitive. That is why BMW is giving its biggest sedan an update for the 2013 model year. The new 7 Series may look the same as the old one, but under the skin there are some significant changes. On the outside, BMW says the 7 Series has a new grille and front fascia, but the changes are hard to notice. LED adaptive headlights are now an option; HID lights are standard. The real changes are under the hood, where BMW tried to improve each of the 7 Series’ engines. The V8-powered 750i and 750Li (long wheelbase) get a revised twin-turbocharged 4.4-liter engine. The new power plant makes 445 horsepower and 480 pound-feet of torque, an improvement over the 2012’s 400 hp and 450 lb-ft. BMW claims a 0-60 mph time of 4.7 seconds and a 25 percent fuel economy improvement on the EU test cycle (EPA ratings are not available yet). The 2013 ActiveHybrid 7 gets a completely new gasoline engine. The 4.4-liter V8 will be replaced by a turbocharged 3.0-liter inline six. Total system output is 349 hp. That is a significant drop from the 2012 model, which had 455 combined horsepower, allowing it to go from zero to 60 faster than a non-hybrid 7 Series (4.5 seconds, to be precise). BMW says the 2013 ActiveHybrid 7 will hit 60 in 5.5 seconds. Hybrids are about fuel economy, though. According to BMW, that will improve the 2012 model’s 17/24 mpg city/highway by 14 percent, which might be enough for some buyers to excuse a lost second in the 0-60 sprint. At the bottom of the lineup, the 740i and 740Li get the same inline-six used in last year’s model and this year’s hybrid. They do gain stop-start capability, as do the V8 models. At the opposite end of the spectrum, the 760Li’s V12 carries over unchanged, retaining its 535 hp and 550 lb-ft.
BMW will try to give all 7 Series customers a more comfortable ride by making rear air suspension standard on all models. All 7 Series models will also be available with Dynamic Damper Control, which can independently adjust the shock absorbers. Rounding out the changes are simulated floating rear monitors for the iDrive control system, a 3D navigation display, and a new Bang & Olufsen sound system. BMW did not say whether prices for the 2013 7 Series would change, but 2012 models start at $71,895 for a short wheelbase 740i, and climb to over $140,000 for a loaded 760Li. The 2013 7 Series goes on sale this summer, except the ActiveHybrid 7, which arrives in the fall.